Midea air conditioner showing an error code? 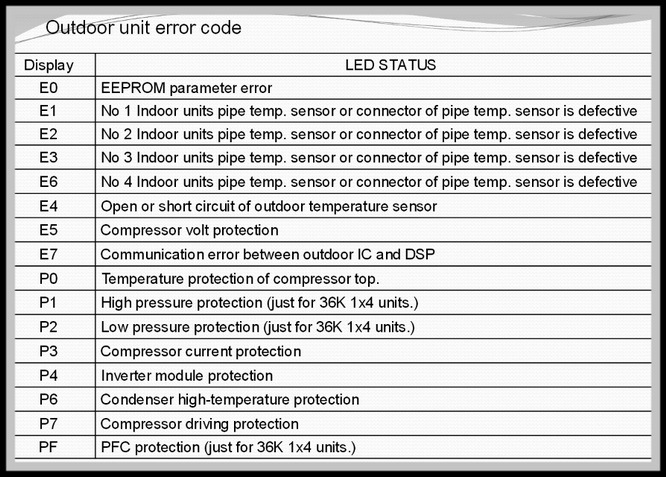 Whether you have an indoor or outdoor model Midea AC, the error code lists and fault definitions are below. These error codes will help you to understand what is causing the error on your air conditioner. You can then identify the problem and order the parts you need to fix it yourself. 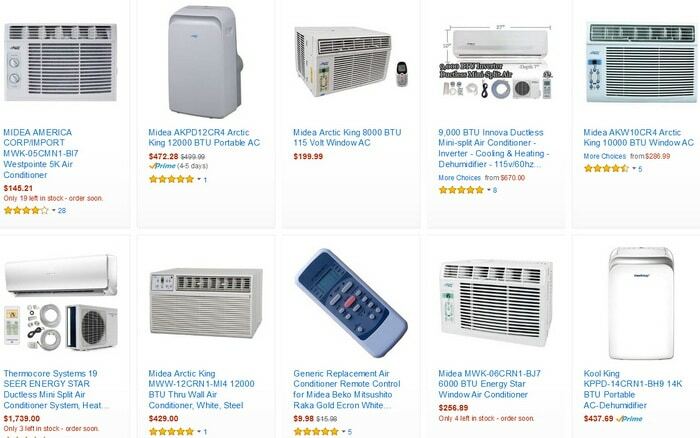 Here is Mideas AC Replacement Parts website and New Midea AC Units and Remote Controls. 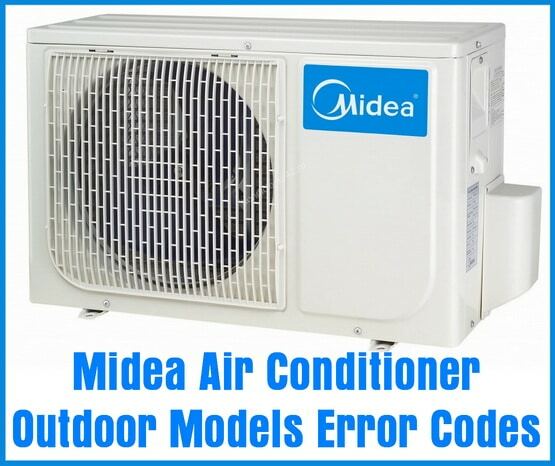 Midea AC Outdoor Units Error Codes And Troubleshooting Guide for Models M2OC-14HRDN1, M2OC-14HRDN1-Q, M2OC-18HRDN1, M2OC1-18HRDN1-Q, M3OC1-21HRDN1-Q, M3OC-27HRDN1, M3OC1-27HRDN1-Q, M4OC-24HRDN1-Q, M4OC1-27HRDN1-Q, M4OC-27HRDN1, M4OC-36HRDN1-Q, M5OA-36HRDN1-Q. Midea AC Indoor Units Error Codes And Troubleshooting Manual For Models PWM093HX, PWM123HX, PWM183HX & MIDEA OUTDOOR A/C UNITS MODELS POM273HX and POM365HX. Midea MDV AC Service Guide For Models MDV-D540 (560, 580, 820, 840, 860) W/S-820, MDV-D280 (220), W/S-810, MDV-J280W/S-810 (811), MDV-280W/BS, MDV(H)-J140 (120), W-510(511), MDV(H)-J160 (180), W(/S)-720, MDV-D100 (120),MDV-J110, MDV-J160, KFR-61T2W/BP or KFR-40×2W/BP-510T2. Do you have an issue with your Midea Air Conditioner? Please leave a comment below and we will be happy to assist you to fix your AC yourself. Midea split indoor model : ms12f-36hrfn1-qc2gw. Indoor gives p6 error code? My Media AC shows a sign EC in the display panel and will not respond to remote what could be the error? its been cooled sometimes but within 2 min or less the cool has low and its feel dry. and the display coming in 30 degrees even when i set in 18 degrees according in user manula instruction. Please help me regarding my problem.The AC is used around 1 1/2 years only. MIDEA mca 24hrn1 what problem is E8. My media AC P11 error code appears after 2-3 minutes of switching on! What does it mean and how to fix please? I installed a 4 multi zone midea mini split 9000btus. And after charging the system the unit ran good cool down. And then moments later on the indoor unit front display it reads to lines. What does that mean?? Sir i need the solution forMidea cassette E3 error . . What is the problem sir? Please suggest. . .
E9 error code on our Midea AC unit – rang the warranty and they let slip that this is the error code for a communication failure between the indoor and outdoor units. Its usually due to an outdoor unit not being secured properly and a connection coming loose. Check all wiring and connections. We also gave out outdoor unit a fonsi style nudge and it starting working again although we now have to do this every time the error code comes up but it seems to work in the short term – next step is to go after the guy who installed ours as he clearly did a bad job – this is the third time we’ve had to call Midea about this unit. Midea AC split system cuts off with an E9 error code. Why does your site not explain this E9 CODE? 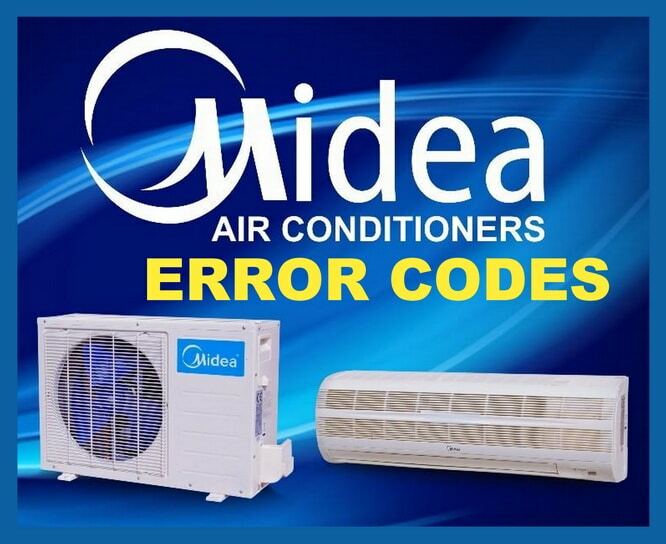 There is no Midea AC split system E9 error code in the database at this time. However we found this by digging further…..
My Air Conditioner Midea shows EC error code and the power button is blinking. When I turn off the power supply then it works for 10 minutes and then show EC error code again (Air conditioner not function). The error code is “EC”. My Air Conditioner Midea shows EC error code and power button blinking. When I turn off the power supply then it work for 30 minutes and then show EC error code is in the display. It is not showing any code. My indoor unit display is showing F7 code and the outdoor compressor is off ?? A/c z not cooling? What is the problem. My midea indoor unit shows cp error what do I do? My AC is MIDEA it turns on and off but after it is on, the remote is not working and also the AC display light is always ON. E7 fault code in my MIDEA air condition ,how to fix it ? Midea unit 36000btu outdoor unit 3 indoor two ducted one caset. Two have been running for a few years added the third this weekend when I cut it all on a line set came loose and lost alot of coolant. Fixed line set pulled vacuum on all lines again and I’m trying to get it running and add more coolant when I start it back up it runs for a minute then stops red light blinking on ducted thermostats and red light on in caset and green light blinking no error codes. I have indoor Midea Air Conditioner. It always appears error EC on its screen and stops working. I switched off from the electricity and back again to work again, not working. AC is Midea Air Conditioner. Every 5 minutes the evaporator and the AC are shutting down and it was indicated by the error F1 and F3. F1 = Indoor unit coil outlet temperature sensor or connector of sensor is defective. F3 = Indoor unit coil outlet temperature sensor or connector of sensor is defective. Installed 2 x Midea inverter units yesterday – 2 different clients. I have a Media AC, the indoor unit is working ok, but the lights on the display do not show up. I have tried the display button it makes no difference. I have a problem of alarm or error code 33. Im getting error code FO then E1 on model MIDEA MCHS-28AVHR. This happened after a power outage. Mine is the same EC and it goes off – it was only installed a week ago what can it be ? I have had the same problem with my split AC. Does exactly the same as described above. My model is not even listed on LG support site which doesn’t make things any easier, but they don’t seem to reference an error code “EC” for any of their units. Only info I have found elsewhere for other mfg units says this code means a faulty eeprom. Media Split type MS12F1-09CR Keeps shutting off after a few minutes. Unit cools when on but shuts off after 10-20 minutes. It won’t come on again unless turned on with remote. I have a Midea AC MS11D3. It started showing E3 error, maintenance came, they changed a piece from the outside unit. As soon as they left, E3 came back. Company came back, took all out of my ac, and told me it was my motor mistake, just had it replaced. They left E3 again. Some cracking sound come smoke come like from cold and the fan came so strong. My Mideast air con unit has started beeping every couple of seconds even when I switch it off at the wall. Does anyone know why ? My Midea split type air conditioner started showing E1 error code on the indoor LED display is there a easy way to fix this? 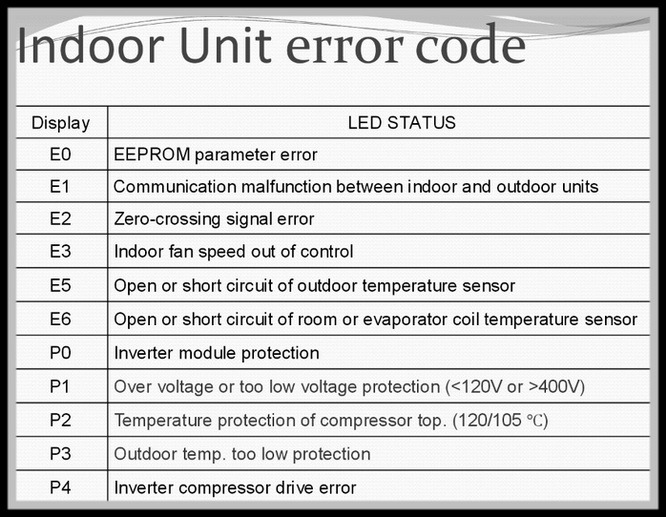 R and 9A series MIDEA AC = E1 error code = Indoor outdoor units communication protection error. 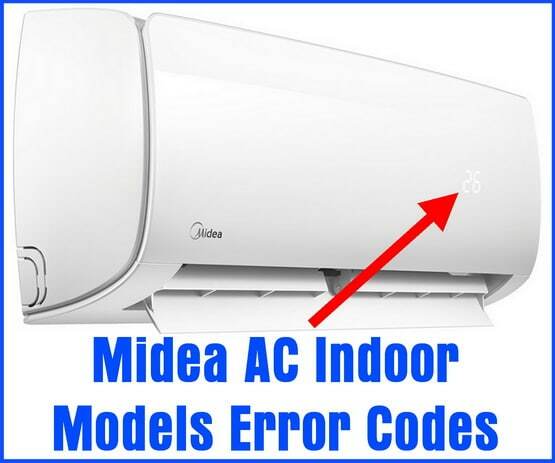 Other MIDEA Air Conditioners including M5OA-36HRDN1-Q = E1 error code = No A Indoor unit coil outlet temperature sensor or connector of sensor is defective. My Midea air conditioner keeps displays EC after about 10 mins into powering it on. I believe EC means error code but that doesn’t explain the main problem. How can I read this error code to understand the exact problem. Plus it does not chill and is always on 24. Midea AC error code EC = there is a possible refrigerant leak. Your Midea Air Conditioner has refrigerant leakage detection. Because of the installation layout of Midea Split air conditioners, it is possible that the AC unit can develop a refrigerant leak. The main effect will reduce the performance of your unit meaning it will not cool as well or not at all. Leaking too much refrigerant can damage the compressor. Midea split air conditioner systems will display an “EC” indicator on the indoor unit display screen. The EC error lets you know that there is a leak in the system. When you see the EC code on your Midea AC, you need to get the unit inspected before any damage can occur. The AC is on 10 minutes then the mcb trips but also error EC appears on the Midea AC. Do you have the model number so we may research your MIDEA air conditioner error code issue further? Installation technician has come twice, says no leak detected. When the unit is on, it cools. I have same problem with my Midea mini split 1 ton AC. I have checked any possible leakage but could not find any leakage as i have been told leakage leaves a black spot on the location of leakage. Also when my ac is running it cools properly. Which means freon is full. What else could it possibly be? If your MIDEA AC is cooling properly, what is wrong? Is the unit shutting off too early or not functioning 100%?